This is my third birthday spent here at Hopeful Parents, my third August 10th post, and the 2-year anniversary of my beginning to write for this site. I wanted to have something lovely and momentous to say, but of course life is squashing me beyond flat right now. It's not so much my special needs kids, but rather my very elderly, now wheelchair bound mother, that is the source of all-consuming care-taking presently. So much so that I missed my post here last month, for the first time in two years. (I have been late before, but never skipped entirely.) Determined to remedy that, I am sitting down at this computer and not getting up until SOMETHING appears on the page. By the time next month rolls around I will (hopefully) have successfully transitioned my mother completely into the "permanent resident" side of the care facility she has been doing her sub-acute rehab time at these past six weeks. This means reducing her worldly belongings from a stuff-packed one bedroom apartment down to about two suitcases, give or take a few cubic feet. And there will continue to be a lot of back and forth, to and from Long Island, 2 to 3 times a week, to visit with my mother. She is so lonely. Next month the kids will both be back in school, and structure - or the semblance of something like it - will once more reign in our lives. But until then, I will be muddling through the chaotic jungle that is a whole MONTH of no school in my autistic son, Jacob's life. Jacob has always loved balloons. Since he was a little boy. If he sees one he wants it, begs for it. And then, once he has it? Smiles one of his giant, super happy, near maniacal grins. Since he was a little boy. Ethan used to hoard balloons, bring them home, cry the next morning upon finding them diminished, shrunken, no longer straining at the ceiling. Has always gotten such joy at loosening them into the sky, watching them fly away. When he was three years old with very little original language, he would summon up fresh words to say "Bye-bye, balloon!" And even wave. And as I contemplate my very earthbound life right now, I am calling up these moments with Jacob, ever grateful that my son is capable of such happiness, that he is, at heart, a joyful boy. And I need to remember that sometimes when I want to hold tight to things, that there can be infinitely more joy is letting them go, watching them fly away. 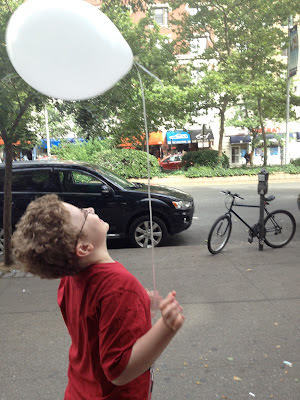 My son, also autistic, also so joyful, releases balloons immediately, as well. There is something magical, and hopeful, about that process. Beautiful post. Envisioning your son releasing balloons with such verve and joy just made me smile. This is beautiful. So poignant.